“A Century of Triumphs,” the centennial history of Kansas City University of Medicine and Biosciences, tells the story of overarching resilience in the face of adversity. 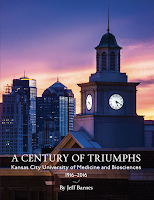 Founded in 1916 as one of the five original colleges of osteopathic medicine, KCU overcame a number of obstacles with dignity and innovation, emerging as one of the top producers of highly qualified, compassionate osteopathic physicians in the U.S. today. Learn more and order the book.